“The lions are on form today,” I thought, marvelling at how far their roar appeared to be carrying across Bristol Zoo‘s exceptionally beautiful botanical gardens. 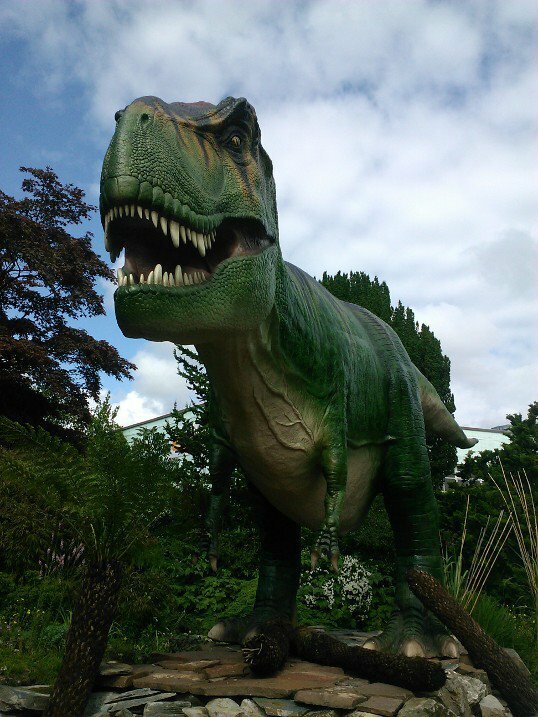 And then I saw it: the first big dinosaur in their new animatronic display, brought in to spice up summer holiday trips to the zoo. There are about a dozen of them on the loose. Most are camouflaged among the spectacular planting, positioned so that you never see a whole one all at once. You first spot a foot or a snout of a tail, before realising you are dwarfed by a monster. Zoological gardens? Jurassic Park, more like. They certainly put the lions in perspective. And not just the lions, either. These lifelike giants put man in his place too. Like most right-thinking people, I’m not a fan of caging animals, but in the case of zoos that focus on conservation, I’m prepared to make an exception. 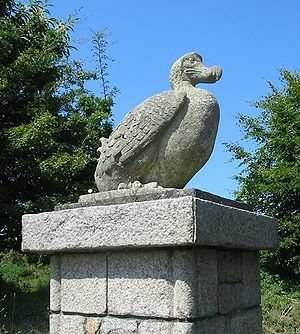 Last year, I made a pilgrimage that I’d been planning for decades to the former Jersey Zoo, now simply known as Durrell, in honour of its founder. Gerald Durrell was a pioneer in animal conservation. When I was a teenager, he charmed me with the killingly funny stories about his eccentric family in “My Family And Other Animals” and infected me with his passion for wildlife conservation. There were tears in my eyes as I crossed the threshold of his zoo. The love, humility and compassion with which the park had been planned made for an emotional visit. On its launch, it was one of a kind, but since then all decent zoos have followed where Durrell led. 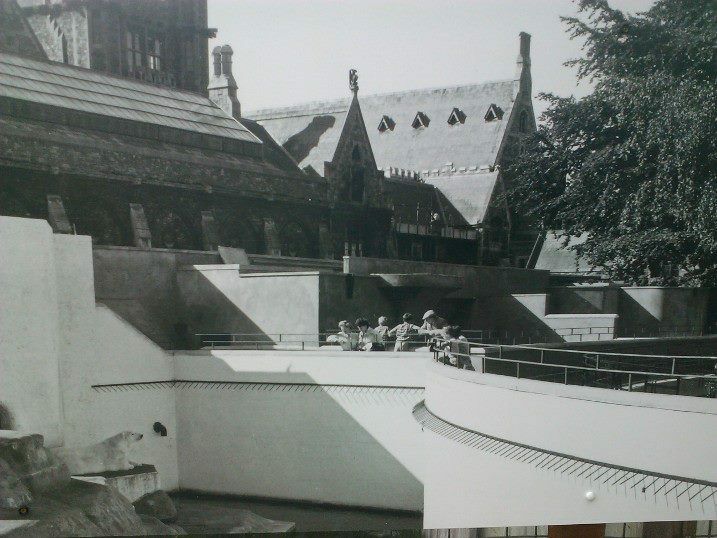 Bristol Zoo was not always so. 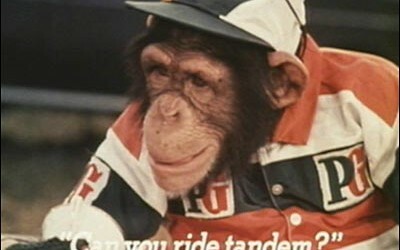 When I first visited around 1978, there were still animals turned half mad by inappropriate cages. Particularly distressed (and distressing to see) was a beautiful polar bear, endlessly pacing and turning, pacing and turning, along the back wall of its cage. When the bear died of old age, it was thankfully not replaced. 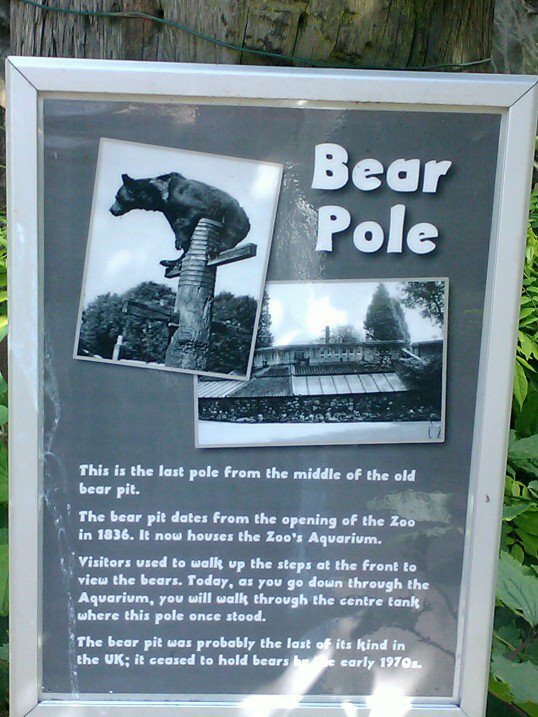 Now, the zoo is apologetic for its past. There are sad memorials to the past errors of its ways. There are the remains of the bear pole, a modest branchless tree trunk that bears once used to climb, to the amusement of the crowd. A notice on the seals’ enclosure, once the site of that pathetic , yellowing polar bear, remarks that in those days, the animals’ cages were designed to be as easy as possible for the keepers to clean. My jaw drops at this revelation, even though I’m old enough to remember when it was considered perfectly acceptable to offer chimpanzees’ tea parties as a visitor attraction and to use them to make advertisements for tea. Rumour had it they were given chewing gum to make it look as if they were talking, northern accents dubbed over the top to give them memorable conversations. So by modern standards it was politically incorrect in terms of the north-south divide too! There were memorable catchphrases. Thankfully, those unenlightened days are long gone. Bristol Zoo now goes to the opposite extreme. Everywhere you go there are reminders of man’s responsibility to respect and preserve the natural world. There are shocking displays of illegal hunters’ trophies and animal-based Chinese medicines. There are samples of products and labels denoting sustainable sourcing of wood and fish. There is also humiliating evidence of how feeble we are, compared to the rest of the animal kingdom. Above much of the park runs the relatively new Zooropia attraction – a series of telegraph poles connected by all kinds of walkways raised high above the ground. 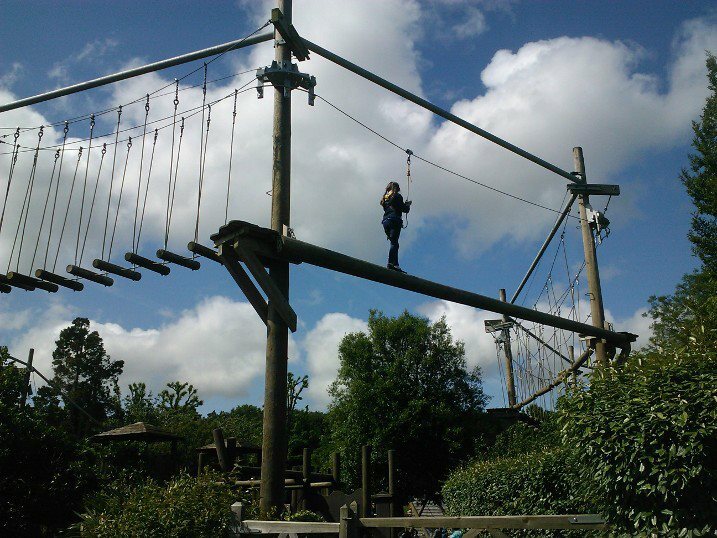 Visitors are invited (for a small fee) to negotiate narrow wires, ropes, tyres and wooden bridges. Despite being securely attached to a safety harness, first-timers quake at the elevation, at the difficulty of their path, and at the thought that missing their footing could send them tumbling from a great height into the gorillas’ enclosure. Each path is named after a particular animal that would make short work of the challenge – another reminder of man’s inferiority in athletic terms. There’s also a compelling series of challenges scattered about the zoo, united by the topical theme of the Zoolympics. You are invited to compare your abilities with that of the animal kingdom. How long can you stand on one leg? Ten seconds? Twenty? That’s nothing compared to the flamingo, which does it for hours at a time. How far can you reach with your arms? Not a patch on the albatross’s wingspan of three metres. How many times can you flap your arms in a minute? Nowhere near as many as the tiny hummingbird’s 5,400 wingflaps per minute (hence the hum from which it gets its name). Don’t expect to emerge with any medals from this competition (though if you want to feel better about your athletic prowess, comfort yourself with a visit to the sloth). I’m grappling with this problem, berating the Zoo in my mind for playing a foolish trick for the sake of increasing gate takings, when it occurs to me that actually it’s a rather cleverer idea than I’d first realised. For surely, the lesson to be learned here is that if mankind isn’t more careful in future, many other residents of the Zoo will be relegated to the status of the dinosaur: extinct. 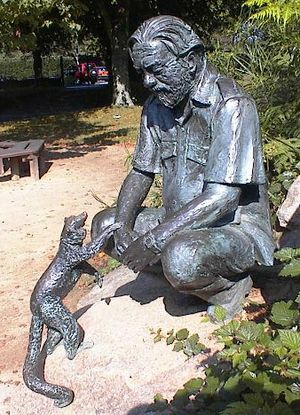 It’s not pure whimsy that guided my hero Gerald Durrell’s choice of animal statues to welcome visitors to his Zoo. Ladies and gentleman, I give you the dodo. If you enjoyed this post, you might like others about our trip to Jersey: Have Hairdrier, Will Travel and What Size is Your Jersey? Or these about other family days out to the SS Great Britain and the Roman Baths at Bath. Thank you, Laura! It’s always a bit hit and miss, weather-wise, with visits to the zoo here in England too, and I guess we have just to be grateful that these indoor facilities exist to keep us dry when there’s a downpour! 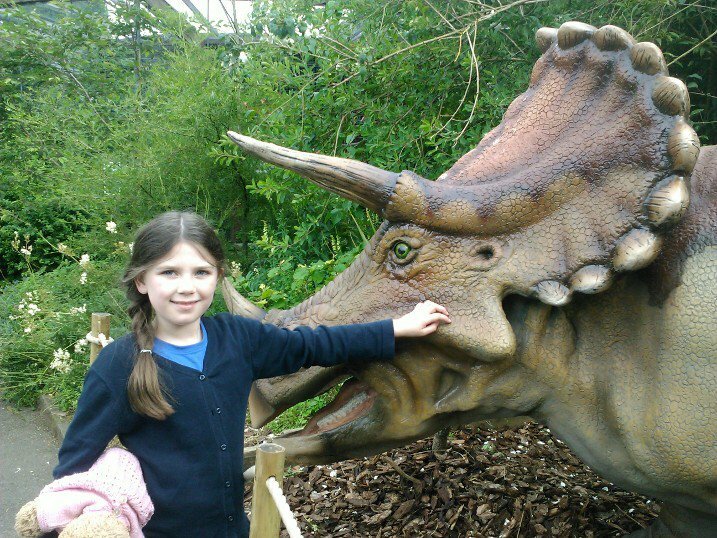 I’ve also had the opposite experience, going to a zoo or other attraction where there’s a good outdoor play area (paddling pools, climbing frames, etc) and my daughter’s wanted to spend the whole time there, rather than seeing the main attraction that we came for. By the way, my best friend from high school used to work at Seattle Zoo, I think – looking after whales, I believe. I love this small world!